A NORTH Belfast care home is celebrating having their first-ever 100-year-old resident. 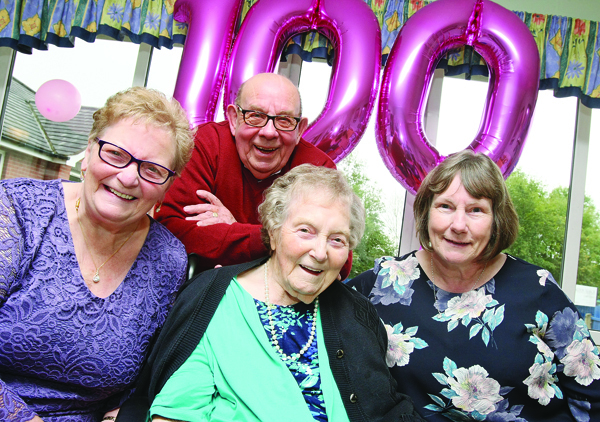 Minnie Wilson, who resides in Abingdon Manor on the Crumlin Road, reached the milestone on October 6 and was joined by family and friends at a party. Originally from Sheridan Street in the New Lodge area, Minnie comes from a family of eight children and has lived across North Belfast including Alliance Parade and Cavehill Road. She started work when she was just 14 years old in an egg factory before working at the Proper Food Products Company in Havana Street in the 1950s. Most of her working days were spent at the NSPCC before she retired in 1979. Minnie married Allan Wilson on February 22, 1938 and they went on to have four children: three boys and a girl. Her hobbies include baking, knitting, reading, dressmaking and family holidays to Carnlough and Blackpool. Minnie became widowed in 2005 and has resided in Abingdon Manor since 2015. Eldest son Allan said it was a great occasion for all the family to celebrate Minnie’s milestone. “I think she is so pleased just how many people turned up to celebrate with her,” he said. “She was especially delighted with her card from the Queen and also from Irish President Michael D Higgins. A tear was in her eye when I read it out to her.